What does the Bible say about the Commands? Over 200,000 Christian Yard Signs shipped to 48 states. Over 1700 churches have purchased at least 100 Ten Commandments yard signs to display in their community. Georgia leads the nation with over 21,150 yard signs. Houston Country, Alabama leads in having more signs in any one county with over 5,000 yard signs. These beautiful Ten Commandments signs are available both in the standard yard signs size of 18x24 inches, and in the larger size of 2' x 3'. The Ten Commandments Christian yard signs are made on long lasting chloroplast plastic. The 18" x 24" signs are two-sided, and the 2' x 3' signs are one-sided. Wire stands are available for the 18" x 24" signs. We also recommend that you buy wooden stakes locally for the 2' x 3' signs. Alternatively, they could be nailed to a tree or post. 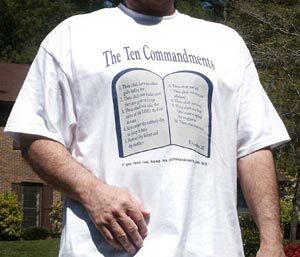 All lettering is in Blue and Blue Reverse These Ten Commandments yard signs are in the King James Version. These Ten Commandments Christian yard signs are in the King James Version. 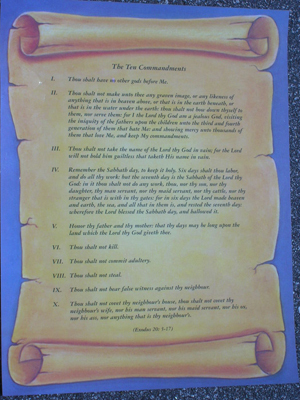 Prices for common quantities of 18" x 24" Ten Commandments yard signs (1 Color) with wire stands and shipping included. 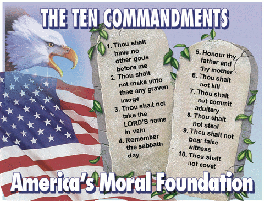 Largest selection of 10 Commandments products -- Click here! * Special: Free Ten Commandments Car Tag with purchase of 5 or more signs, plus free bumper sticker. ** Extra Special: With purchase of 10 or more signs, receive a free Ten Commandments Magnet (size 5 X 7 inches for car or refrigerator) and also a free Ten Commandments Car Tag. 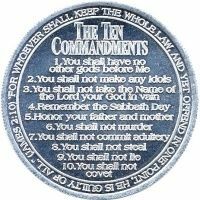 View the Free Ten Commandments Magnets, Car Tags, and Bumper Sticker 10 Commandments and other products. Contact us for prices on quantities not listed. Shipping and handling costs can be waived by picking them up in Huntsville or Birmingham, Alabama or Sparta, Tennessee. Contact us for more information. New! These Ten Commandments yard signs are now in a beautiful color artistic setting. They come in the standard 18" x 24" size. May be placed in your yard, supported by a sturdy steel wire stand. Or, you may want to just display it in your home. With the beauty of this art work, many people are framing these full color signs, and placing them in their homes, or giving them as gifts. To order, please call 256-523-6425. Prices for common quantities of 18" x 24" Christian Yard Signs (Full Color Double Sided). Not including wire stands. For wire stands, add $1.25 each. Shipping is a flat fee of $9.00. Prices for common quantities of 18" x 24" Christian Yard Signs (Full Color One Sided). Not including wire stands. For wire stands, add $1.25 each. Shipping is a flat fee of $9.00. Prices for common quantities of 2' x 3' Christian Yard Signs (One Sided). Ten Commandments Signs Not including wire stands. For wire stands, add $1.25 each. Shipping not included. 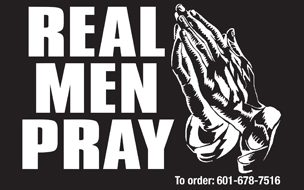 * Special: Free Ten Commandments Car Tag and bumper sticker with purchase of 5 or more signs. ** Extra Special: With purchase of 10 or more signs, receive a Ten Commandments Magnet (size 5 X 7 inches for car or refrigerator) and also a free Ten Commandments Car Tag. Don't forget to ask about these free items when you order. For larger quantities tell us how many bumper stickers or car tags it will take to make you happy. There are promises for keeping commandments. We are commanded to teach them to children. We are requested to display in homes. 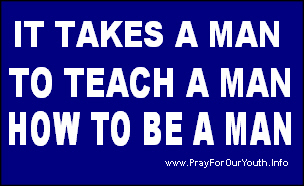 Christian Car Magnet, a message to young men. A list of the Ten Commandments can be found in Exodus 20. We are commanded to teach them to kids. Ten Commandments of the Bible of yard signs throughout the country. It is inspiring to drive down a street and see one yard after another with these inspiring yard signs. Your neighborhood needs to be next! Help us put the God's moral law back up across the nation by erecting them in your yard, wearing them on your shirt, or supporting them with a sticker on your car. 17 Think not that I am come to destroy the law, or the prophets: I am not come to destroy, but to fulfill. 22 But I say unto you, That whosoever is angry with his brother without a cause shall be in danger of the judgment: and whosoever shall say to his brother, Raca, shall be in danger of the council: but whosoever shall say, Thou fool, shall be in danger of the gehenna of the fire. Was it in concert with thee that I ordered the morning light; and that the day spring knew its appointed time  to tinge the wings of the earth-to scare the wicked from it? Didst thou take clay of the earth and form an animal and place on the earth a creature endowed with speech? [IS] Hast thou withdrawn the light from the wicked, and broken in pieces the arms of the haughty? Hast thou gone to the head spring of the sea; and walked in the footsteps of the abyss? Are the gates of Hades opened to thee in fear, and are the porters of Hades struck with awe at seeing thee? Hast thou informed thyself of the breadth of that which is under heaven? Tell Me, then, what is the extent of it. In Deuteronomy Chapter 5, The moral laws are listed, and then in the following chapter 6, the importance of teaching them to your child is emphasized: "And thou shalt TEACH them diligently unto thy children, and shalt talk of them . ."
This Ten Commandments Poster on scroll background is free to you upon your request. This poster is laminated with plastic on both sides for years of service. Size is 14x18. For quantities of 10 or more, please provide explanation of your use for them. For example, are you going to give them away for your Sunday School Class or church? Not for resale. These posters are free to you. A donation for our shipping expense would be appreciated.